Confession: I'm a train otaku. Ever since I found out that you can take a train to JB from Singapore, I've been making up excuses to go to Johor. Need to buy bread? Go JB. Need to visit dentist? Go JB. Want a massage? Go JB. 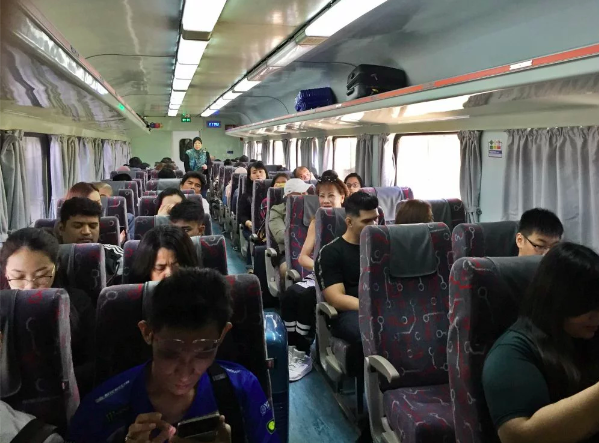 But even if trains don't make you go all <333, the train is still an excellent way to travel to JB because they cut out all the stress and waiting of traffic jams and queueing up at customs. A return trip costs only about S$10, but the real savings here is time. The train ride is just 5 minutes long, which means even after buffering in customs clearance and all, you can zip across the border in half an hour. 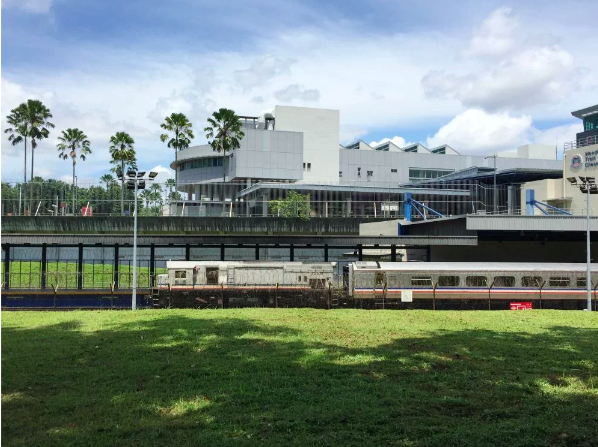 This is the complete idiot's guide to taking the train from Singapore to JB. 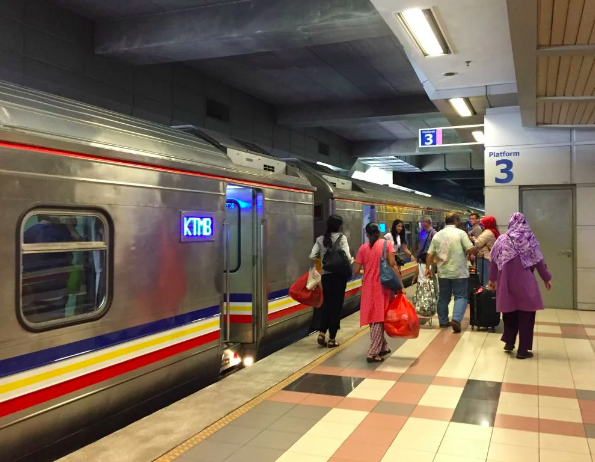 The one train that services the Singapore to JB route is called Shuttle Tebrau, and it's operated by Malaysia's national train operator, KTM. As you can see, there are plenty of trains every day, but that doesn't mean you shouldn't pre-book your train tickets. 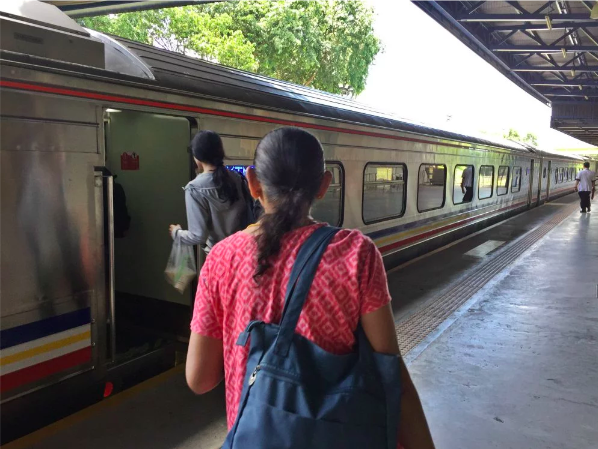 From experience, you'll need to book weeks in advance if you want to catch the train to JB on weekends and Friday nights. 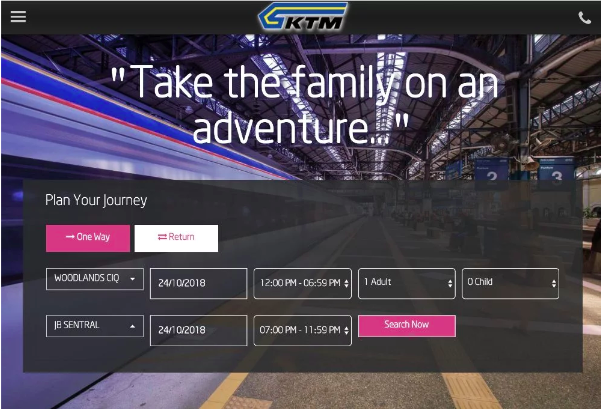 I definitely recommend buying return tickets (MtYR 16) on the KTM website. 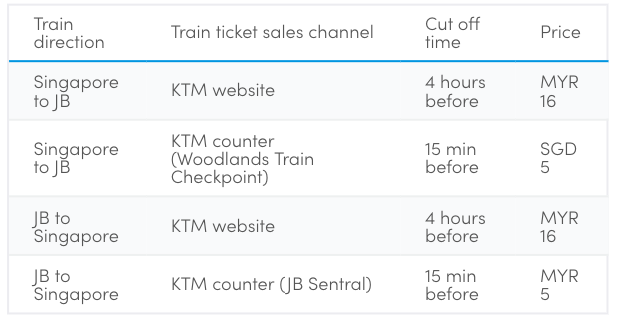 Yes, they're a biiit more expensive than buying over the counter, but counter tickets tend to sell out fast, especially on the JB Sentral side. 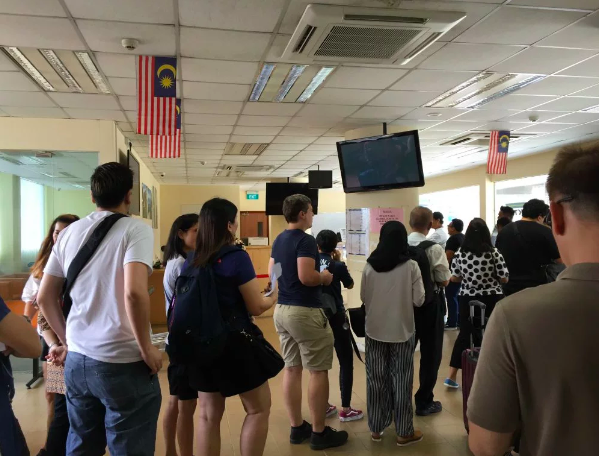 KTM online booking closes 4 hours before the train departure time, so if you missed this window, you can try your luck by queueing at the KTM counter at Woodlands Train Checkpoint. Tickets here cost $5 one way, which is slightly cheaper. You'll need to show the counter staff your passport and make payment in cash. 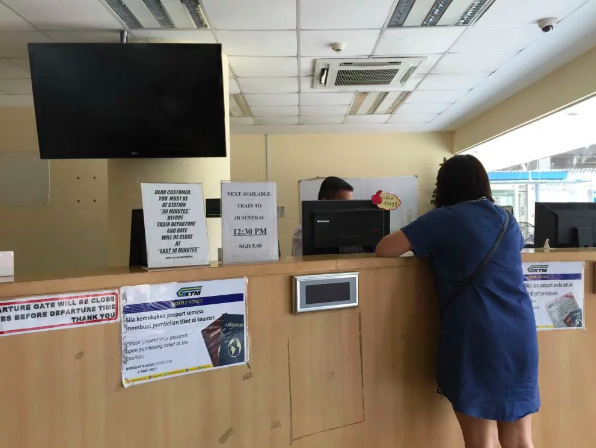 Ticket sales cut off 15 minutes before train departure. By the way, I would really recommend buying your return train tickets (from JB to Singapore) at the same time. The few times I showed up at JB Sentral to try and score MYR5 tickets home, the next few trains were totally sold out. 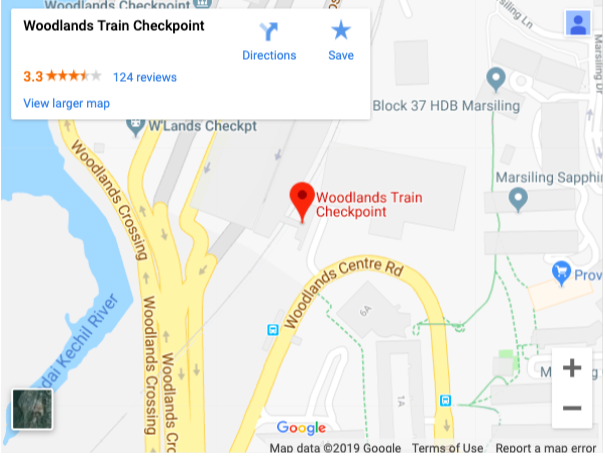 Assuming you got your KTM train tickets sorted online, the next step is to find your way to the Woodlands Train Checkpoint. 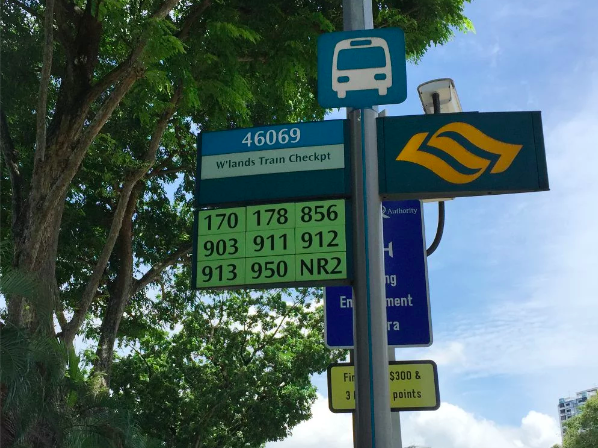 It's actually in the same area as the regular Woodlands Checkpoint, but with the bonus of being very close to the bus stop/drop-off point so you don't have to rub your flesh against throngs of human beings. The KTM ticket office is on the ground floor of the building. 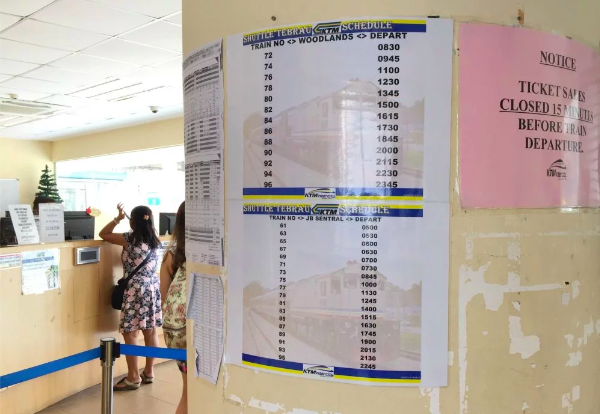 If you already have your printouts, just go up to the 2nd floor where you'll see a queue of train passengers waiting on the left of the walkway. Join them and wait for the boarding gates to open. Come at least 30 minutes before because you need time to clear immigration on both sides before you get on the train. The boarding gate closes 10 minutes before train departure. Like I mentioned, you'll pass through both Singapore and Malaysia immigration before you board the train. 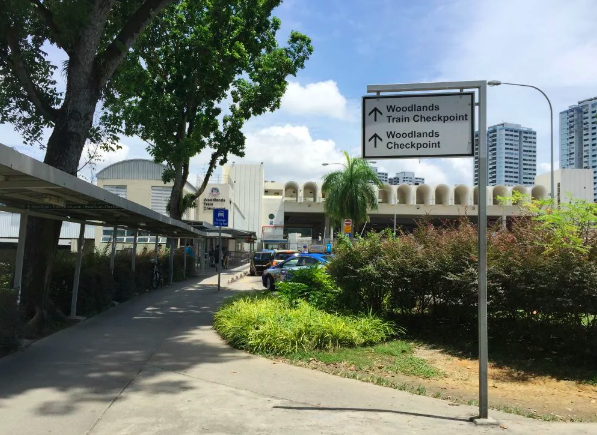 First you'll clear Singapore customs, which is a simple matter of scanning your passport and thumbprint through automated gates, just like at the airport. Then you'll walk a few metres to the Malaysia side, where it's a bit less efficient as the customs staff will check and stamp your passport manually. After you're clear, put your bag(s) through the scanning machine, pick it up, then board the train. There will be a large "free seating" sign so go ahead and sit anywhere you want. Don't be afraid to enter the next car - there's no First Class or anything. KTM trains are often oversubscribed so you might find yourself having to stand. This is perfectly safe and it's just a few minutes anyway. 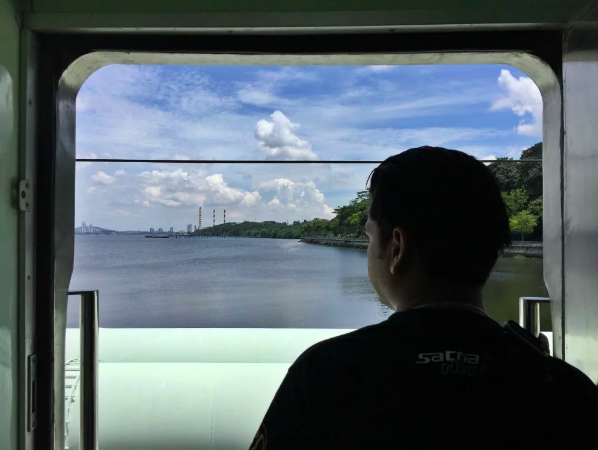 Enjoy the view of the Straits of Johor and feel smug about making good life decisions as your train goes past the poor losers stuck in the Causeway jam. 5 minutes later, you'll arrive in JB Sentral. From here, you can chiong Rotiboy, run amok in City Square, queue for banana cake at Hiap Joo Bakery, Grab to IKEA Tebrau, or whatever it is you plan to do with those ringgits. 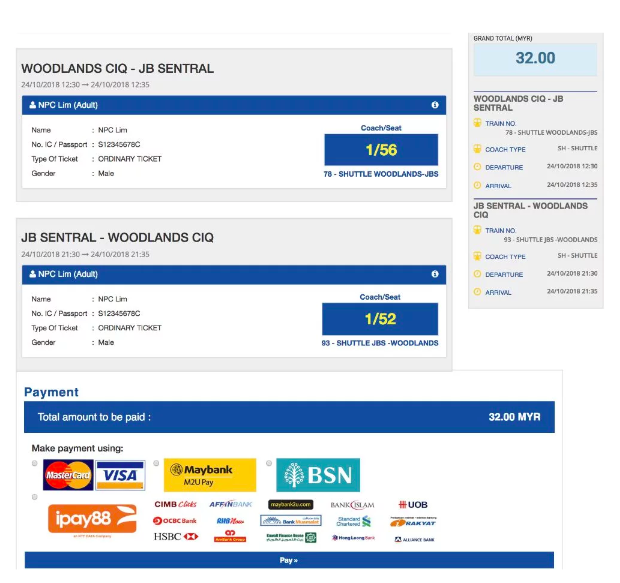 All in, taking the train to JB should get you from Woodlands Train Checkpoint to JB Sentral in about 30 minutes. In contrast, taking a bus, taxi or car from Singapore to JB is highly unpredictable because of traffic. They say time is money, right?